The quintessential romantic comedy gets a 1980s update and a Gibraltar setting for this vibrant and hilarious production, currently packing them in at the Wyndham’s. Of course the two stars must be a huge attraction for ticket buyers but I like to think that Shakespeare’s funniest and most delightful comedy has enough appeal in its own right. The two stars are David The Doctor Tennant and his erstwhile companion Catherine “Donna Noble” Tate. What a nerdgasm that is, for Doctor Who fans to see this pair reunited and finally doing what the Doctor and Donna never did – getting off with each other. The chemistry between these two actors is almost palpable, and the “merry war” of wits between their characters is a verbal fireworks display of point-scoring and one-upmanship. The modern (1980s is not that far back in my view, thank you very much) setting works very well, given the slangy, modern inflection with which the actors deliver the sparkling dialogue. 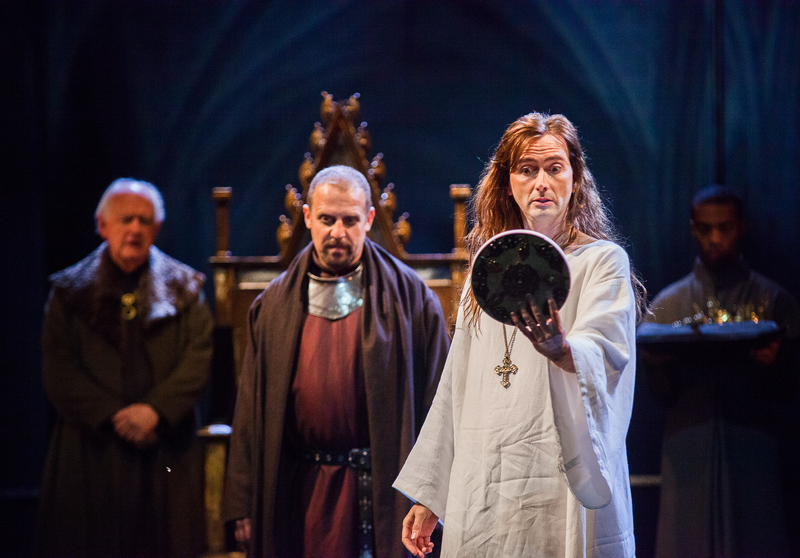 Tennant lends Benedick his native Scots accent and within Tate’s Beatrice there are traces of her repertoire of comic characters – for example, when quoting the Devil, she gives Old Nick the scowl and tones of her Gran. All of this is very fan-pleasing and makes for an interesting take on Shakespeare’s most entertaining female character. This Beatrice is stylish and gregarious, wearing a mask of confidence made of put-downs and wise cracks. Tate adds some touches of sublime physical comedy, ranging from the broad flailing around in the air on the end of a decorator’s pulley (you had to be there!) to removing the underwear from her bum in a moment of unladylike behaviour. The performance is not without its subtlety. Shakespeare allows the briefest glimpse into a suggested past liaison between Beatrice and Benedick, and Tate plays the moment perfectly. We fall in love with this wonderful woman. She is more than matched by Tennant’s Benedick, the dashing, swaggering soldier, the self-proclaimed eternal bachelor. Tennant proves his own skills at physical comedy. There’s a wonderful moment involving a tray of paint (trust me) and I think he has topped his Hamlet of a couple of years ago – I felt his Danish prince had too much of the Time Lord about him but this Benedick retains the Doctor’s energy without merely translating the Doctor to another time and another place. The set, with its huge revolve and towering pillars, threatens to dwarf the actors, especially from my perch in the Grand Circle, but I quickly became accustomed to its graceful transitions, and the gliding monolithic columns and gigantic slatted blinds serve the action well, especially in the comic, eavesdropping scenes. One scene in a nightclub has just a little too much dry ice but on the whole, I approve of this relocation. Dogberry, the leader of the Watch, is a tricky character to pull off. A verbose buffoon whose every other word is a malapropism (long before Mrs Malaprop ever graced the stage, bless her) in this production he is presented as a gung ho Territorial Army type, linguistically out of his depth in this world of flying wit and word play. I warmed to him but his sidekick, Verges, was under-used, which was a pity. The gender realignment of Leonato’s brother Antonio into wife Imogen was an interesting move, but she didn’t really put across the right amount of anger and impotent outrage in the face of the “scambling, out-facing , fashion-monging boys” who have torn her family apart. Overall though, the star for me is William Shakespeare. The play is a dazzling, endearing box of delights with just enough bitter sweetness and humanity to be poignant without killing the buzz. The jokes and the banter still work. The plot, both a contrivance and a confection, still permits moments of high drama. Leonato’s spurning of his scandalised daughter is heart-wrenching on the page and in performance. This production is a party, complete with 80s retreads of Shakespearean songs, to which the audience is invited. We are dazzled, delighted, moved and rewarded with a reminder that to be human and share the company of other humans is life’s greatest gift. Thoroughly life-affirming theatre.